13.8 billion years ago, the first atoms in the Universe began to form. These were the lightest elements possible, combining just one or two protons and electrons to form hydrogen and helium. The first stars fused these atoms together to create heavier elements such as carbon, oxygen and nitrogen. At the end of their lives, the stars exploded to eject their creations as gas and grains of solid dust. Successive generations of stars formed to further enrich the cosmos, until our own Sun was born. Encircling the young protostar was a dusty disc that would form a planet consisting of 94 different chemical elements and the starting kit for life. The path from hydrogen and helium to the wealth of compounds that form the Earth is the story of our Universe. But it is a tale whose details are obscured by dust. Due to the finite time it takes light to reach us, we observe more distant galaxies during a younger epoch of the Universe’s history. In theory, this should allow us to look back in time and watch the generation of chemical elements and dust. This would tell us when and how stars and planets like our own became possible. Such a plan is thwarted by at least half the energy ever emitted by galaxies being absorbed by the dust they create. The result is a shroud that is thickest over the very regions where dust and heavy elements are being formed. This makes it extremely difficult (and sometimes impossible) to accurately estimate the star formation, the composition of the gas or even the age of a galaxy from optical light. But while dust absorbs optical light, longer wavelengths of radiation can pass through unimpeded. Like a night surveillance camera exposing a thief, the best telescope to expose star and dust formation is one that detects infrared. All objects emit infrared radiation at a wavelength that corresponds to their temperature. This includes the dust itself, which emits, rather than absorbs, infrared wavelengths. Detecting the infrared coming from the Universe therefore allows a view both through the dust and of the dust itself. For this reason, JAXA and ESA are developing plans for SPICA: a telescope that detects infrared light. SPICA aims to follow the creation of heavy elements from the first galaxies to planets like our own. Standing for the SPace Infrared telescope for Cosmology and Astrophysics, SPICA aims to follow the creation of heavy elements and dust from their beginnings in the early galaxies through to the building of planets. Since the Earth’s atmosphere absorbs infrared radiation and SPICA needs to be very cold to detect distant heat signatures, the telescope needs to orbit in space. SPICA will have a so-called “SE L2 halo orbit”; an orbit around the Sun-Earth L2 point, which is a stable location where the gravitational pulls of the Earth and Sun on a small object like a telescope balance one another. From this orbit, the Earth and the Sun are always in the same direction, allowing SPICA to insulate more easily against the incoming heat flux. The instrument itself will also emit heat, so SPICA’s 2.5m telescope will be cooled to below a very chilly -265°C, just 8 degrees above absolute zero. This low temperature reduces the intensity of the telescope’s own infrared emission by 100,000 times. 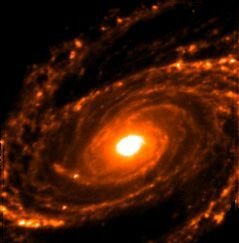 Observational image of the spiral galaxy, M81, taken in the infrared (at 7 microns) by JAXA’s AKARI space telescope. The combination of both a large and cold telescope separates SPICA from previous missions to study the Universe in the infrared. Past infrared instruments have either been small and cool with telescopes below 1m in size, or large but less sensitive due to a warmer temperature. As a result, SPICA is expected to be more than 100 times more sensitive than flagship infrared observatories such as ESA’s Herschel, NASA’s Spitzer and JAXA’s AKARI. SPICA achieves its size and icy temperatures using a novel cooling mechanism. Conventional cooling systems use slow evaporation of liquid helium to keep temperatures low. While effective, the necessity to include a large tank of liquid helium into the weight budget for launching the instrument reduces the possible telescope size. SPICA will avoid this problem by using a new concept for space cryogenics developed at JAXA. This system uses a chain of mechanical cryocoolers that remain cold by repeatedly compressing a gas at constant temperature, and then allowing it to expand and cool. It is a system that has previously been tested successfully on JAXA’s ASTRO-H X-ray observatory. SPICA has a nominal lifetime of three years, but the goal is for the telescope to last at least five. The main instruments on SPICA are the SMI and SAFARI. Between them, they can explore the infrared Universe between 17 – 230 microns. (Optical wavelengths that our own eyes can detect stretch between 0.39 – 0.7 microns.) This places SPICA in a wavelength range between the those detectable by the up-coming NASA James Webb Space Telescope (JWST) and the ground-based Atacama Large Millimeter/submillimeter Array (ALMA). The SMI is the Spica Mid-infrared Instrument that is being developed in Japan. As the name suggests, SMI explores mid-infrared wavelengths that sit between 20 – 40 microns. The second instrument is the SpicA FAR-infrared Instrument (SAFARI). SAFARI covers longer infrared wavelengths between 34 – 230 microns. The instrument is being developed by a global consortium involving Europe, Canada, the US, Japan and Taiwan. 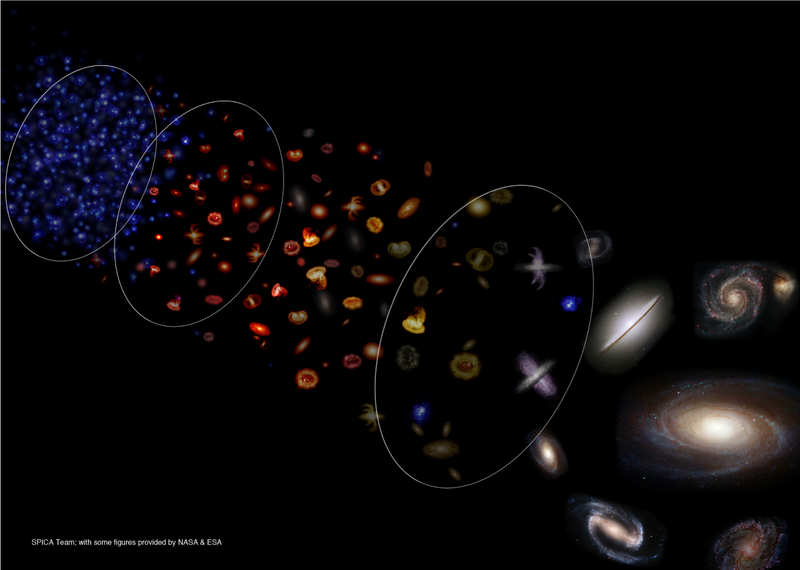 As a telescope designed to track our formation through the evolution of the Universe, it is perhaps not surprising that SPICA also has a long history. The telescope was first proposed in Japan in the late 1990s, with the name “HII/L2Mission”, referring to plans to launch the telescope on JAXA’s HII rocket and to orbit the L2 point. While both the L2 orbit and the JAXA launch vehicle (now planned for the H3 Launch Vehicle) will still be used, SPICA was redesigned in 2015 as an ESA-led mission for the ESA M5 and JAXA Strategic L-class mission programs. The result of the collaboration is a more powerful facility than the original plans. On the SPICA Science Team at ISAS/JAXA, Toru Yamada is particularly keen to see what SPICA can reveal about the production of heavy elements at the peak epoch of star formation in the Universe. 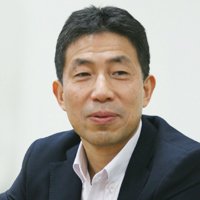 Professor Toru Yamada is on the SPICA Science Team at ISAS/JAXA. “During the earliest phase of formation of galaxies, very intense star formation (possibly a few thousand times of what we see today in Milky Way) as well as the growth of Super Massive Black Holes can be completely hidden in optical light due to the heavy absorption by thick dust clouds,” he explains. Super Massive Black Holes (SMBHs) are thought to sit in the heart of every massive galaxy. Their mass is proportional to the galaxy’s mass, suggesting an intimate link between the growth of the black hole and the production of stars. In galaxies like our Milky Way, the star-forming gas is largely unaffected by the SMBH. However, this is not true in younger galaxies where gas and dust are falling into the black hole. Like a coin speeding up as it is dropped into a deep well, gas accreting onto a SMBH gains energy. This is released in jets and radiation, both of which can have a strong impact on the galaxy’s star formation. Such an active black hole in the centre of a galaxy is known as an “Active Galactic Nuclei” (AGN). Both AGN and young massive stars blast energy into the surrounding gas. This is absorbed by the heavy elements, which re-emit the radiation as far infrared. The exact wavelength emitted depends on the quantity of energy absorbed. This differs depending on whether the source was an AGN or young massive stars, giving a way to distinguish between these sources of energy. SPICA is sensitive enough to detect the different wavelengths in the far infrared to reveal which energy source is controlling star formation in the critical epoch of galaxy formation. SPICA has the ability to survey hundreds of galaxies in this way, stretching back to the earliest objects when the Universe was only a few billion years old. 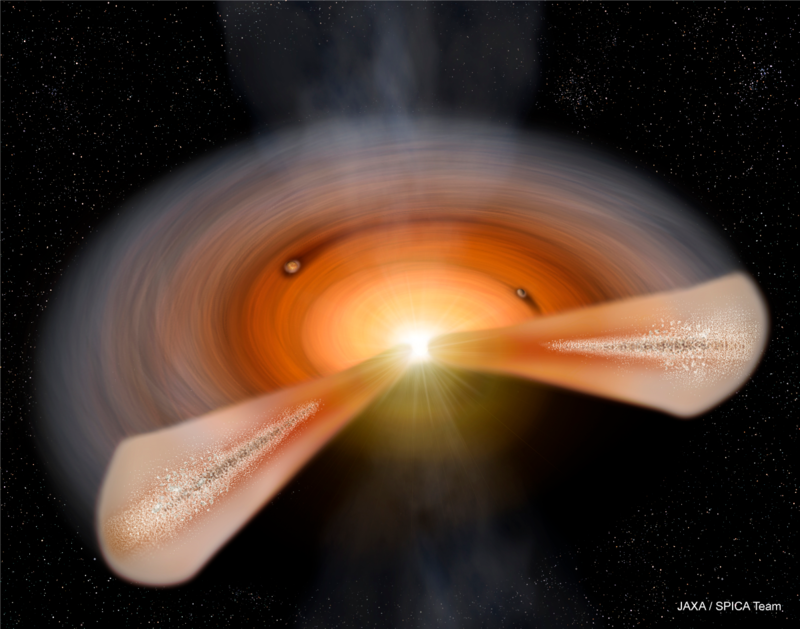 SPICA will follow the evolution of protoplanetary discs, from formation to dispersion and the location of the ice line; an essential piece of the puzzle for understanding water delivery to rocky planets. Closer to home, SPICA will also tackle major questions in the planet formation process. Since planets are usually detected long after their formation, it is hard to know how long their formation took or if their orbits have changed over time. This makes it very difficult to judge whether any might be like our Earth. With its high sensitivity, SPICA will be able to detect dust around stars to only a few times brighter than the dust that remains in our evolved Solar System. This allows the telescope to measure the mass of planet-forming discs, from the youngest dust-rich systems to those evaporating to leave a system of planets. The result will reveal how much planet-building material is available over time, putting a clock on formation processes. SMI will also be able to measure the “snow line” in planet-forming discs, where ice begins to solidify and join in the planet-forming process. This location is thought to be essential for the formation of gas giants such as Jupiter, which require ices to gain their huge masses. It also reveals the distribution of water at the start of these planetary systems, providing hints as to how our world got its oceans. The importance of SPICA is reflected in plans released by both ESA and JAXA. The ESA announcement in May made SPICA one of three missions being considered for its M5 program, with the final decision to be made in 2021. At JAXA, SPICA is presently a Phase A1 mission, selected for an intensive concept study. Consideration for project approval at JAXA is planned before 2020. The telescope was also explicitly mentioned in the “Roadmap 2017: Fundamental Concepts for Promoting Large Scientific Research Projects”; a document to promote large project priorities in Japan developed by working group of scientists and members of the Ministry of Education, Culture Sports, Science and Technology in Japan (MEXT). If both the space agencies approve the mission in the early 2020s, a planned launch date around 2030 is being considered. Once launched, the veil over the last 13.8 billion years of our history can be lifted.